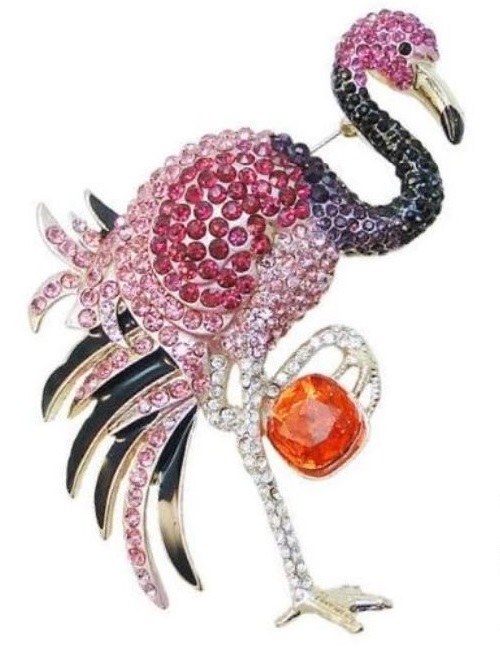 This flamingo brooch by Cartier was acquired by the Duke of Windsor just before the German occupation, designed by Jeanne Toussaint. 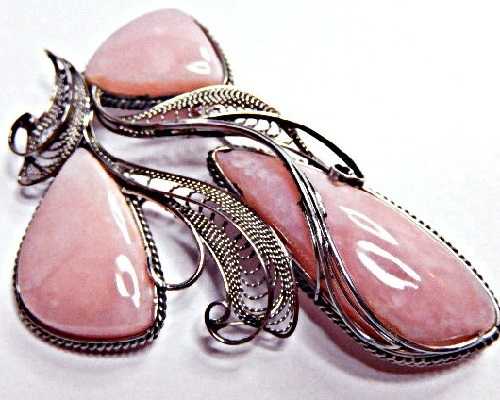 The generous plot size of the brooch makes it exceptional for this period. 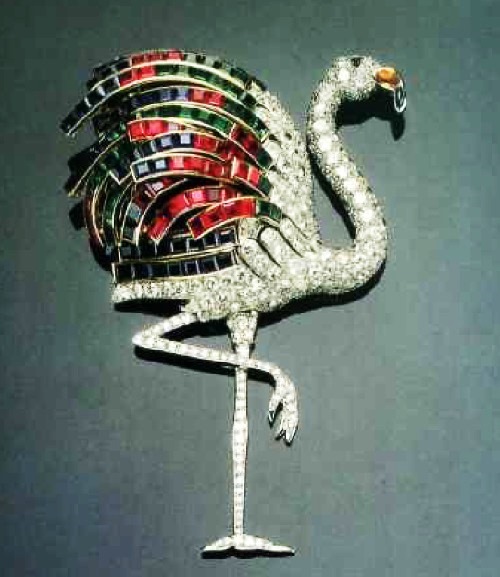 After the sale of the Duchess of Windsor jewelry at auction Sotheby’s in Geneva in 1987, on the market appeared many copies of this brooch made of precious stones and crystals. 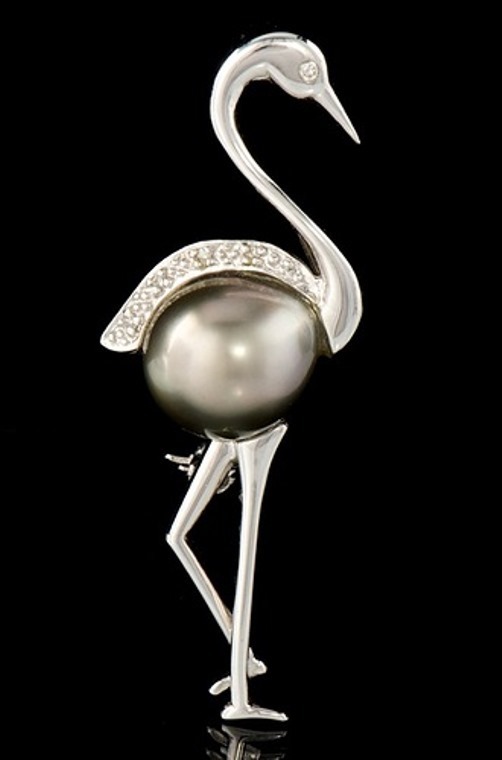 Bird flamingo – a symbol of the fulfillment of your desires. Flamingo – beautiful and unusual bird because of its plumage. Some species of flamingos have bright plumage, resembling flames. That’s why it is called a fiery bird. Some flamingo have gentle pink color of feathers. Therefore they are called the bird of dawn. 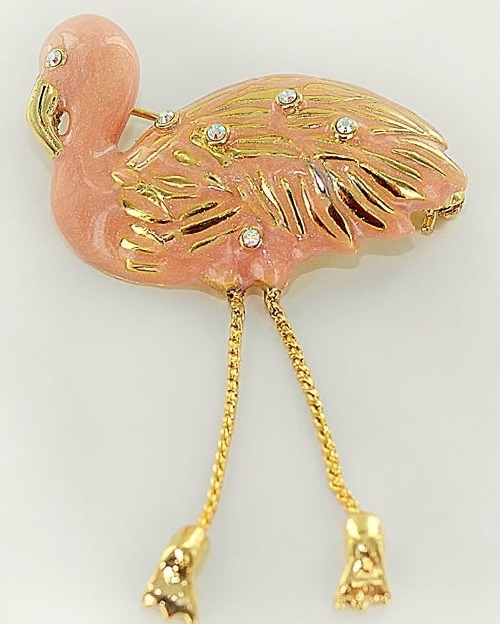 Pink color of Flamingo for most people represents a symbol of beauty and elegance. One of the many legends dedicated to flamingo, tells how flamingos regretted people dying of starvation in the lean years and helped them. 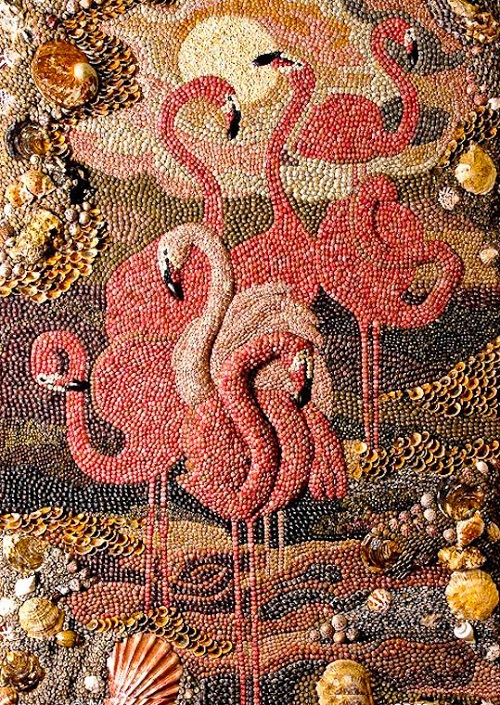 Flamingo fed poor people with pieces of meat, hatched out of its body. The blood flowing from the wounds, fell on their feathers and dyed them pink. The plumage of flamingos remains such a pink color to the descendants of survivors to not forget about it. 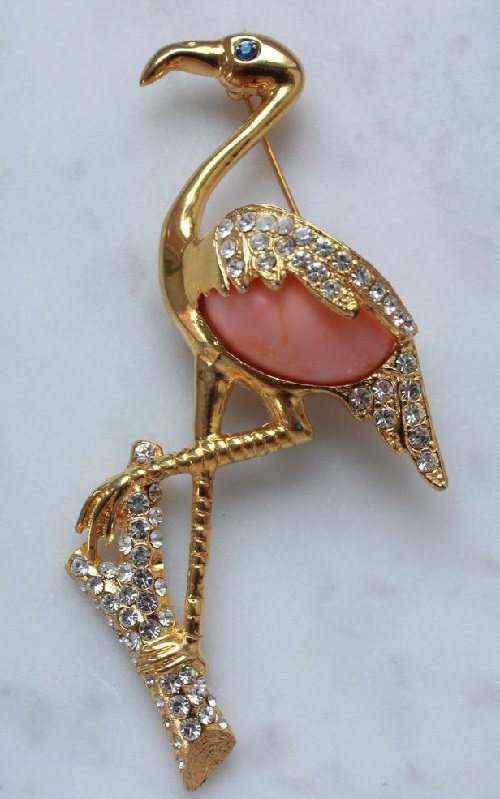 In Egypt, the ancient Egyptians revered flamingos for divine and sacred beings bird. 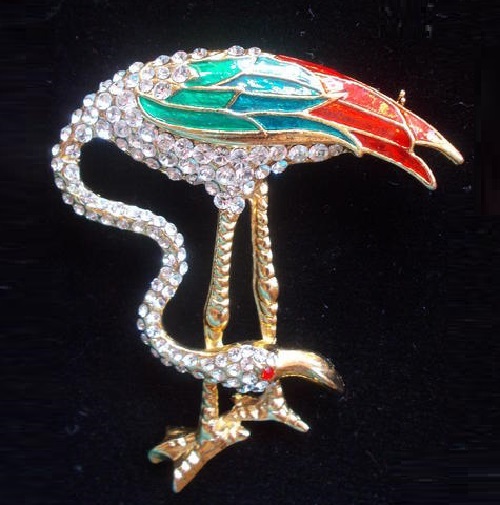 Flamingo personified Egyptian god of sun – Ra. Not by chance on images of old frescoes the ancient Egyptian sun god is depicted with the head of a flamingo bird and the human body. In Latin, flamingo sounds like a Phoenicopterus, which is translated as “purple wing”. 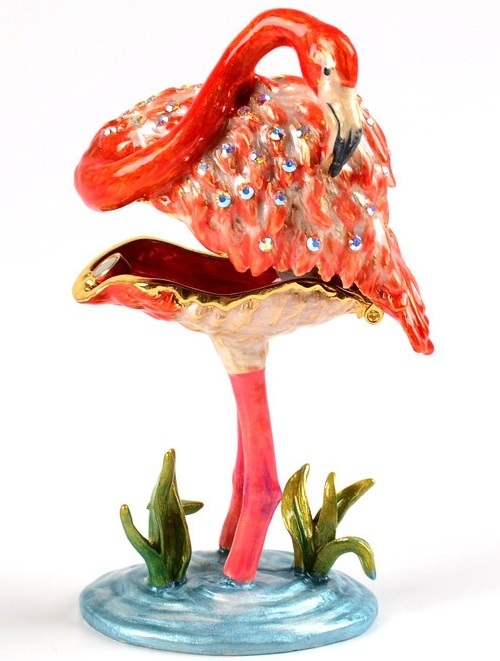 Flamingo – a prototype of the mythical bird Phoenix. It is known that according to legend, at the end of his career phoenix burned in the fire, then certainly reborn from the ashes. 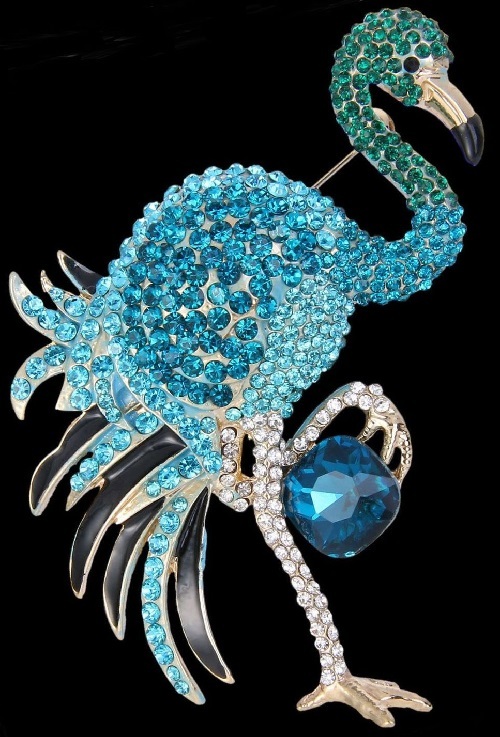 It is no accident it is believed that the prototype of flamingos are lycidae phoenix, symbol of transformation and rebirth. In Chinese mythology, the phoenix bird is considered a miracle. The phenomenon of the miracle of the birds is a great sign to people, portending a very important event. In the Chinese dictionary about Chinese Phoenix is said that this extraordinary bird has a neck, like a snake, goiter, like swallows, rooster’s beak, it is at the same time has the front similar to the swan, the back to the unicorn, the tail like a fish tail, and the patterns on the body. According to Chinese belief, the Phoenix bird appeared last time in 1368, on the eve of the death of the Yellow Emperor, the founder of the Ming Dynasty. Bird phoenix in China – a symbol of sun, fire, heat, summer. Since the Chinese phoenix has always been considered “the wife of” the dragon, the phoenix mascot helps to create not only a strong union, but it even helps childless couples. Talisman with phoenix of red or fiery color will bring happiness, the victory, the beauty and wisdom, help in the prosperity. And to the creative people will assist in the execution of their desires and achieving the goal. 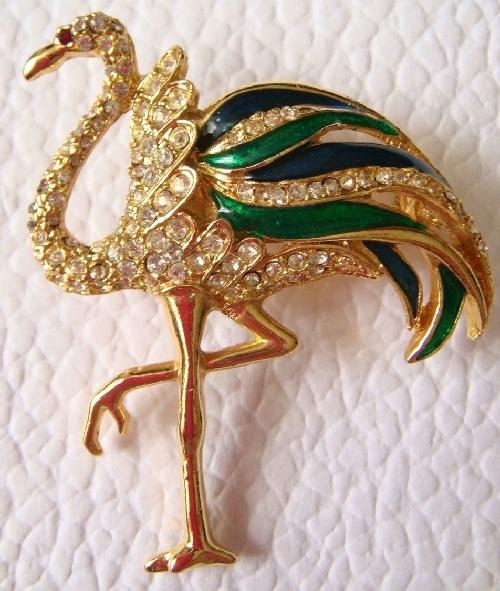 The painting, statue or other object with a symbol of the phoenix bird, or flamingo should be placed in the element of fire sector, in the South (South sector – a sector of Fame, and then your fame and popularity will gain strength. Next to the mascot shouldn’t be placed many other figures and objects, as the bird should have enough space and no obstacles, to be free to spread wings and fly. 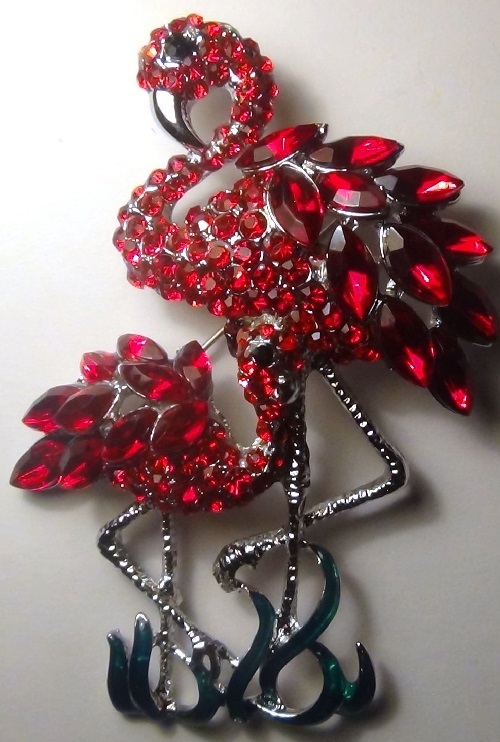 Talisman with phoenix or bird flamingo will protect your home from danger, the first to bring the news to your home, which in turn will develop and strengthen your intuition.